Everyone is well acquainted with the twelve days of Christmas, in the modern era, that is being replaced by 6 days of overconsumption. The period around Thanksgiving is the busiest U.S. shopping period of the year. Thanksgiving has long been a spectacle of consumer overindulgence, but now this rampant consumerism extends well beyond Black Friday. Marketers are finding more ways to entice consumers, but they ignore the fact that we cannot sustain our current rate of consumption. Thanksgiving is an environmentally destructive holiday; however, some of the shopping days which follow offer modest improvements that move us a few inches in the right direction. According to a National Retail Federation (NRF) holiday consumer spending survey, nearly $586 billion will be spent over the 2012 holiday season. Their data indicates that spending in stores and online rose to $59.1 billion in the four days starting on November 22. Over the Thanksgiving weekend, the Federation said shoppers increased their average spending from $398 in 2011 to $423 in 2012. The NRF also said that turnout was up 4.6 percent from the period last year. However, they note that Holiday shopping is being spread out over a much wider time frame. Black Friday “is certainly not dead,” said Matthew Shay, chief executive of the trade group National Retail Federation, but “it’s starting to spread out. Now we’re seeing, really, a five-day weekend” said Mr. Shay of the retail federation. To entice Americans to buy more, some retailers decided to open the day before Black Friday’s pandemonium. 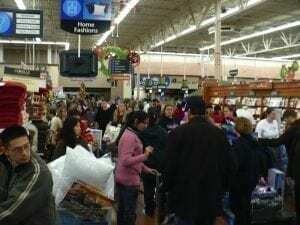 Thanksgiving Day shopping has been dubbed Black Thursday. The NRF indicated that the number of shoppers on Thanksgiving Day 2012 rose to more than 35 million from 29 million last year. According to the Federation, about 28 percent of people surveyed said that their shopping started at midnight or earlier on Thanksgiving. In 2009, when major retailers started experimenting with Thanksgiving openings, that figure was just 3 percent. The day following Thanksgiving is Black Friday in the U.S., the busiest shopping day of the year. All across America, the Friday after Thanksgiving is renowned for the hordes of shoppers it attracts. On this day, most major retailers open extremely early, and offer promotional sales to kick off the shopping season. The expression Black Friday originated in Philadelphia in the 60’s and more recently, the term has been explained as the point at which retailers begin to turn a profit, or are “in the black”. In 2011 several major retailers opened early on Thanksgiving Day. The New York Times reports that ShopperTrak data shows that store visits on the Friday after Thanksgiving rose 3.5 percent from last year, to more than 307 million visits. The day after Black Friday, is Small Business Saturday (SBS). This day started in 2010 as a day when people “shop small”, in support of America’s small businesses. November 24th 2012, marked the third SBS. According to pre-holiday research from the National Federation of Independent Business (NFIB) and American Express, Americans planned to shop small and spend big on SBS. In 2011, more than 2.7 million Facebook users, 230 public and private organizations, 75 corporations and elected officials in all 50 states and Washington D.C. declared their support for SBS. Last year, more than 500,000 small business owners leveraged an online tool or promotional materials for SBS and 15,000 businesses signed up for free Facebook advertising to promote their products and services in the run up to SBS. Of the tens of millions of Americans familiar with Small Business Saturday, 67 percent said they were planning to “shop small” on SBS and 44 percent said they shopped at small businesses on SBS in 2011. Of those consumers who shopped last year on Small Business Saturday, 70 percent plan to spend more or the same amount this year and will spend on average $100. In an effort to cram even more holiday shopping into the post Thanksgiving period, some have proposed an event called “Sofa Sunday.” In 2011, the term Sofa Sunday was coined to describe the popularity of iPad shopping on the Sunday following Thanksgiving. This event reflects the emerging consumer trend of using mobile devices to shop online from the comfort of home. Catalog Spree shopping data from Sofa Sunday, November 25, 2012, shows that iPad shoppers shopped on Sunday as much as they did on Cyber Monday, with both days’ sales growing substantially over 2011. With the intent of increasing shopping, Sofa Sunday has expanded consumer’s ability to shop outside of traditional shopping periods or locations which now includes the workplace. Catalog Spree’s shopping traffic via the iPad on Cyber Monday tripled in 2012. Cyber Monday is a marketing term for the Monday immediately following Black Friday. It was created by companies to persuade people to shop online. The term made its debut on November 28, 2005 in a Shop.org press release. According to the Shop.org/BizRate Research 2005 eHoliday Mood Study, “77 percent of online retailers said that their sales increased substantially last year on the Monday after Thanksgiving, a trend that is driving serious online discounts and promotions on Cyber Monday this year (2005)”. In 2006, Shop.org launched the CyberMonday.com portal, and in 2010, comScore reported that consumers spent $1028M online on Cyber Monday (excluding travel, 2009: $887M), the highest spending day of 2010. Cyber Monday is now an international marketing event. More people are buying online even before the Cyber Monday event. Sales increased 17.4 percent on Thanksgiving, and 20.7 percent the next day, according to I.B.M., which tracks e-commerce transactions from 500 retailers. Green Tuesday, also called Fair Trade Tuesday, is one of several ways people are trying to brand the Tuesday after Thanksgiving. With the addition of Green Tuesday, the five day shopping weekend has been extended into a six day consumer bonanza. The Green Tuesday event started on Tuesday, November 29, 2011 by the non-profit environmental group Green America, which is ostensibly dedicated to green shopping activities and sustainable products. Green America’s Web site, GreenDeals.org, offers discounts on products like self-watering systems for indoor and outdoor plants and annual memberships for car-sharing or bicycle-sharing clubs. All of the businesses featured on their Web site are from local and national green businesses that are by Green America. Not everyone is happy with six solid days of consumerism. An increasing number of people are resisting the seemingly endless stream of marketing designed to get consumers to buy more than they need. As reported in SmartMoney, MarketWatch.com said that hundreds of thousands of customers, employees and shareholders have signed an online petition to protest Target’s opening on Thanksgiving night. Adbusters promoted Buy Nothing Day on the 23rd and 24th of November and on November 27th they asked Americans to make donations to charity. Consumers have tremendous power to improve our world, it starts with buying less. When we do make purchases, we need to make simple choices like avoiding products made of plastic or products that come with excessive packaging. By putting their spending power to work on less environmentally harmful products, consumers can dramatically lessen their impacts on the Earth. Some of the choices are easy, like buying products that are labeled organic, local, or fair trade. Others aspects of making responsible purchases require a bit more research. While there are a plethora of green shopping options, not all are equal. Just because a company claims to be green does not mean that they actually are. To be a green consumer engaged in responsible consumption, do a thorough investigation before you make a purchase. Unbridled consumerism is antithetical to ecological betterment. Green consumers can help to establish new patterns of consumption that decrease wastefulness and eschew overconsumption. We all need to be more environmentally aware consumers and part of that responsibility involves not falling prey to marketing gimmicks. While there are some redeeming features to new shopping days like Green Tuesday, overall, the marketing events around the Thanksgiving holidays are the harbingers of an environmental hell.